Ever wondered what those waist-high bars at the bus stop at corners on Soto Street and Cesar Chavez Avenue are? You’re not alone. But, according to LADOT, I have the answer: you are supposed to lean on them. 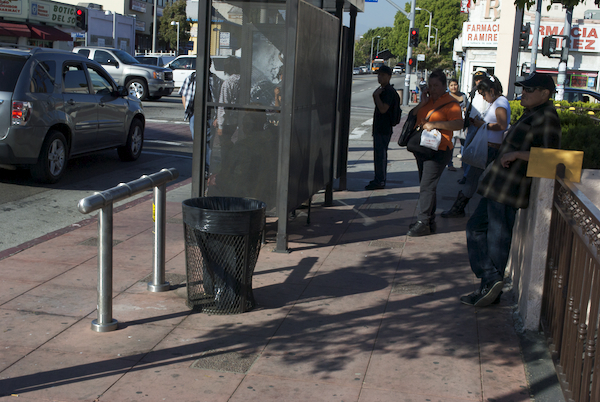 Los Angeles Department of Transportation’s Bureau of Transit Services pursued Call for Project funding from the City of Los Angeles to install “lean bars” at four bus stops at the corners of Cesar Chavez Avenue and Soto Street. Bus stops that receive street furniture are chosen by a contractor with the city, who profits from the advertisements on the benches and shelters. As a result, many popular bus stops don’t receive benches, while less popular ones do because the advertisements are visible to the motorists zooming by. But, that’s not the case for lean bars. The lean-bars were placed at busy bus stops that did not have the physical space to accommodate either a transit shelter or bus bench, or where the placement of a shelter or bench would have impeded the flow of pedestrians too much at these locations. The lean bars were also typically placed with enhanced pavement at the bus stop, There were two different lean-bar configurations; one was a straight bar (in plan view) and the other was curvilinear and formed a shallow “S” in plan view. Pedestrians walking on sidewalks at the intersection of Cesar Chavez Avenue and Soto Stree thave to wade through people waiting at the bus stop, street vendors, and other pedestrians when walking at this corner. The density at this intersection makes sense to use the lean bars because it saves walking space, and can provide a simple rest for riders waiting for their bus. But, like many physical spaces installed by city agencies in Boyle Heights, they are not always used as intended. 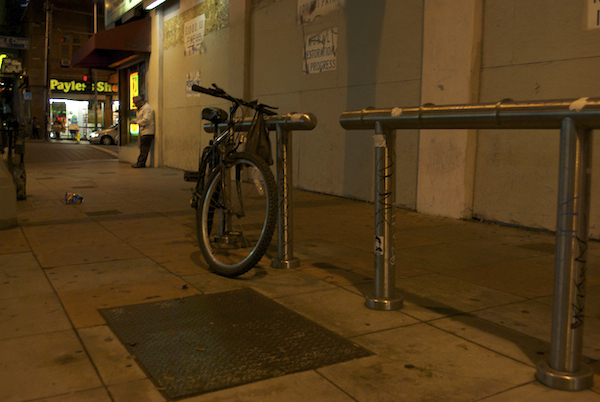 Community blogger and Boyle Heights resident Erick Huerta said that he thought the lean bars were bike racks at first. While Huerta has used the lean bars while he waits for the No. 68 bus lines that run east and west, he says the east lean bar is unshaded and gets the full brunt of the sun during midday. Testing the bars popularity, I stood for an hour Thursday afternoon at the south bus stop, there was not one bus rider that leaned on the bar. Instead many either sat at the bike shelter nearby or leaned against the wall to take shade behind the bike shelter. The other lean bar North of Cesar Chavez Avenue isn’t even located at a bus stop. While I wasn’t able to confirm in time for publication why the lean bar was installed across the street from the bus stop for south moving traffic, I did note that the lean bar was hardly used, except for the time it was used to lock up a bike. I always wondered WTF those were supposed to be… another piece of nearly worthless infrastructure that lets pedestrians and transit users know that they’re not a priority for LADOT. On a positive note thanks for the extra bike racks. This bus stop needs bigger shelters to accomodate all of the waiting passengers, and a canopy than is several feet wider for shading. The crowding on the sidewalk makes it less comfortable for pedestrians to move past this area. If the excuse is that this is the best we can do with this little space, then build a traffic island and put the larger bus shelter on that. Can’t be done? Oh yes it can. The idea that we are going to consider the amount of space needed for motorized traffic first and then see what is left over for cyclists, pedestrians and people waiting for a bus has got to change. Nice story , more more ! I never noticed them but will pay more attention to see if they get used. During my daily treks, I always see pedestrians that utilize the bus lines wait in the sun or in the rain. I always ask myself what customer service. Why wouldn’t they take better care of their customers by placing coveted shelters. In the top photo of the Lean Bars it’s obvious why no one is using them. There is a trash can right there. I’m a transit rider (most bus) since 1992. I don’t want to stand next to a trash can.